An all-in-one solution for online media gallery. It supports images, videos, YouTube and Vimeo, provides built-in LightBox effects, supports Google Analytics event tracking, works on Windows, Linux, Mac, Android, iPhone, iPad and all modern web browsers. HTML5 Lightgox adds stylish lightbox effects for images, YouTube, Vimeo, mp4, m4v, flv, ogg, ogv and webm videos on your website. 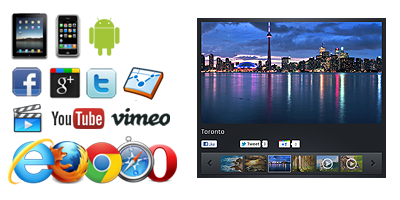 It's esy to install, easy branding and works on Windows, Linux, Mac, Android, iPhone, iPad and all modern web browsers. An all-in-one solution for online media gallery. It supports images, Flash, videos, YouTube and Vimeo, provides built-in LightBox effects, supports Google Analytics event tracking, works on Windows, Linux, Mac, Android, iPhone, iPad and all modern web browsers.